This October, 18 members of Aylsham Community Church responded to Vlada’s invitation to go, whilst the rest of the church received prayer guides to join with us in prayer during the weekend. One of my highlights was when one of sessions was about to start and Sonja declared with a broad smile, “Aylsham is here!”. Being a Relational Mission church means that we are not isolated but part of a much bigger church family, and families visit one another. We didn’t need to go with any agenda or purpose to be an encouragement, just turning up was enough! Being part of such a large family means there is plenty of opportunity to be an encouragement to those in pioneering situations both here in the UK and abroad. Good News Church is served so well by their leadership team. They may be few in number but there is no room to sit back and be a passenger. It was commented to me that they run more ministries than the number of people in the team. Not only were we on the receiving end of being served so well by the team but it was great to hear about some of the work they are involved in and to see it in action. This included Voice Youth outreach, Voice Kids outreach, Talk English, Breakfast for Roma children, and a small group in Svrljig. Their passion for the church and compassion for people is clearly evident in the way they serve. I had the honour of preaching on the Sunday morning, and invited people to come forward for prayer at the end. 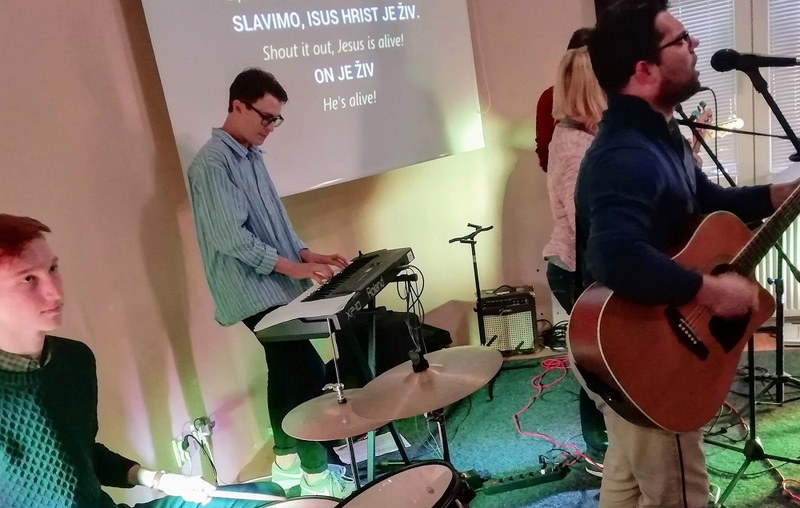 Miloš, who has only been part of the church a few weeks, came forward. Through an interpreter I asked him why he had come forward and if there was anything specific he wanted prayer for. He replied, “I just want to be prayed for and to receive a blessing!”. Do we wait until we have heard the audible voice of God before we respond, or are we quick to ask people to pray for us, just to receive a blessing? We had the privilege of visiting a Roma community outside of Niš. Upon arrival we were taken to a large field and were told of its history, how it is ‘God’s Land’ and some of the prophetic words associated with it. They have a clear vision to build a church building that will seat 600 and have an international impact within the Roma community. They are so excited about the prophetic words and vision that God has given them that they take visitors to the site and explain it to them. I’m grateful to be part of a church where we too are building on prophetic words and vision given to us by God, but how often do I share it with visitors with the invitation to “come and see”? A stark reminder not to neglect the prophetic words and vision God has given me personally for my life as well. We were also led onto the estate where the Roma community live where we had an opportunity to minister to people. People who are living in poverty but with such faith that they brought their sick for us to pray for them. Despite their circumstances there was such joy which was clear to see on their faces. When things don’t seem to be going my way, is my response ‘woe is me’ or ‘joy in Jesus’? Meals are not rushed. Time is taken to sit round the table, eat at a leisurely pace and enjoy one another’s company. In our short time there it was easy to see that this is where the stuff of life gets discussed and relationships are built and deepened. Our team from Aylsham included many generations from teenage to eighties, a good representation of the church family. For the Atthill family, this was the fourth time we had been to Niš. Owain joined us as part of the team and we met up with Yasmin who is serving Good News Church during her ID gap year. Only God knows the seeds that were planted in Yasmin’s heart at an early age ahead of making the recent decision to spend a year there. With many opportunities to serve others in our Relational Mission family there will be times when it’s right to go individually or as a couple. However, don’t neglect the opportunity to involve your children because God has a plan and purpose for their life and He knows which country that will be in!